Joel Arthur Rosenthal affects to be known by a single name: JAR (no periods). His shop in Paris’ Place Vendôme has no display window, no regular hours. It does not advertise and opens its doors to only a select few, including Elizabeth Taylor, Elle Macpherson, Barbara Walters, Ann Getty, Mary Pinault and Jo Carole Lauder (and reportedly Marie-Josée Kravis, Marella Agnelli and Princess Firyal of Jordan). According to a report by Forbes, the craftsmen in Switzerland and France who make is jewelry produce only 70 to 80 pieces a year, each of them one of a kind and many designed with a particular buyer in mind. JAR reserves the right to refuse to sell an item if he doesn’t think it will look good on the intended wearer. His creations often sell for twice what the first buyer paid. Rosenthal graduated from Harvard in 1966, then moved to Paris. He dabbled first in scriptwriting, then needlepoint, opening a tiny shop where he experimented with unusually colored yarn. Its clientele included designers from Hermès and Valentino. Rosenthal one day was asked if he could design a mount for a gemstone. That sent his career in a new direction. After a brief stint as a salesman at Bulgari in New York he returned to Paris in 1977 and started designing pieces that relied at first on inexpensive stones like coral, moonstone, and minute colored diamonds. He focused on pavé, a technique for setting small stones so close together that they look paved with jewels. His settings are so finely wrought as to be virtually invisible, and gradations of color progress from subtle to vivid. Unlike other jewelers, he uses a dark metal alloy for the settings to highlight the gems’ color. 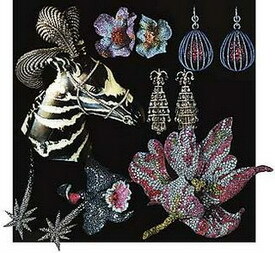 Only twice has Rosenthal displayed his jewels to the public, most recently in London in 2002. Four hundred pieces lent by 145 JAR faithful were crowded into small vitrines. He insisted that the lights be dimmed and that flashlights be given to his guests, who groped and gaped their way from case to case. Considering how hard hit the Beverly Hills community now is by the current economy, you just might find the unthinkable, a JAR piece in a high-end pawn shop. If you do, and happen to have an unusually large amount of money to spare, a JAR piece would certainly be a glamorous piece to add to your investment portfolio. If you think we were just joking about finding a piece of JAR jewelry at a Beverly Hills pawn shop, we really weren’t. The pawn shop industry in exclusive California neighborhoods is doing gangbuster business. Read about it at: Beverly Hills Pawn Shop Sees Surge. Pawn Shop Sales Point to Recovery?